In Europe, Germany is taking the lead in the switch from fossil and nuclear energy to renewables. This creates new challenges as wind and solar energy are fundamentally intermittent and to some degree, unpredictable. It is therefore of considerable interest to investigate what effect these changes have on the overall trend and volatility of the electricity price. While market coupling promises to reduce price volatility, dependence on renewable energy sources (RES) might have the opposite effect. To elucidate the combined impact of these two developments, we investigate the evolution of the electricity price on the German day-ahead market over the course of the last 11 years (2006-2016). Our main observations are that price volatility has decreased rather than increased. Furthermore, excess wind production during off-peak hours correlates well with the occurrence of negative prices. Finally, daily price profiles show a gradual shift in peak- prices away from the day-light hours, and this shift is more pronounced during the summer than in winter. This points to a growing influence of solar production on prices. Khoshrou, A, Pauwels, E.J.E.M, & Dorsman, A.B. (2017). 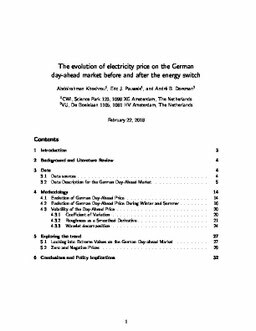 The evolution of electricity price on the German day-ahead market before and after the energy switch.